Bullseye With Jesse Thorn is an interview show featuring the best guests you can imagine. I like to think of it as a vastly hipper version of Fresh Air. It's on NPR, and is also a free podcast (subscribe via iTunes or RSS). At mental_floss we love Bullseye. So we're teaming up. Here's the first in a series of Bullseye interviews, transcribed, with little timestamps when each nugget of discussion begins. The first interview is with Caroll Spinney, who has played Big Bird (and Oscar the Grouch) since 1969, when the show began. 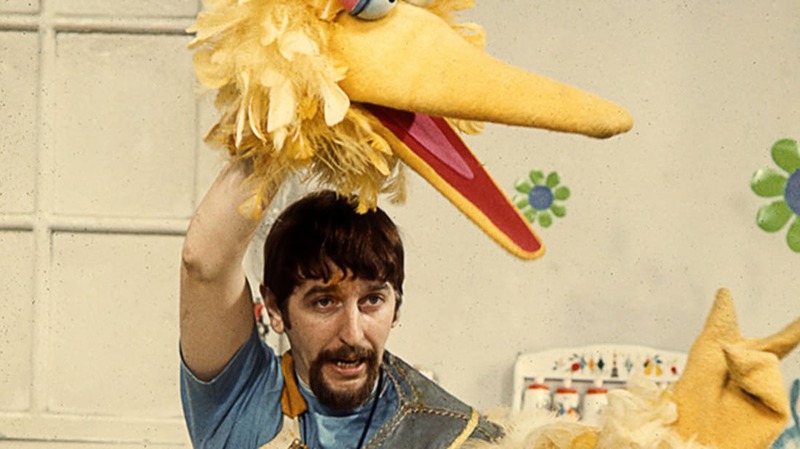 The interview also includes Dave LaMattina, who directed the upcoming documentary I Am Big Bird: The Caroll Spinney Story. Here are five things we learned from Jesse Thorn's interview. You can also run the SoundCloud player and jump to the times noted, if you like. (11:51) Jesse Thorn: Caroll, can you tell me a little bit about how you physically inhabit the Big Bird costume? Jesse Thorn: I liked seeing an actual...like, you strapping on an actual belt to help hold up your leg-pants. Caroll Spinney: Well, then they made it more practical. They made it more like hip boots where you put on pants that are made of rubber in that case, and the feet are attached like hip boots, but this now it's all orange fleece and with those pink stripe circles around his legs. Then the rest of it is all put together in one piece, and my assistant fixes up my lower beak and a tab that you can't see which is hid in the feathers, of yellow cloth. She can pick it up and it's made of a series of hoops, getting wider to make his size, and smaller as it goes up the neck. I lean over and they slide him over me. I reach up and put my hand in his head and wiggle my fingers into place to get the controls, so my little finger will move the eyes. I’ve learned, since I have a monitor inside to study ... how to angle him to show either joy, or worry, or angst. My left hand goes into the left arm and the right one can move up and down because of a fishing line in a see-saw movement, but [Big Bird's right hand] can't grab anything like my left hand. Any props I use have to be picked up by my left hand. 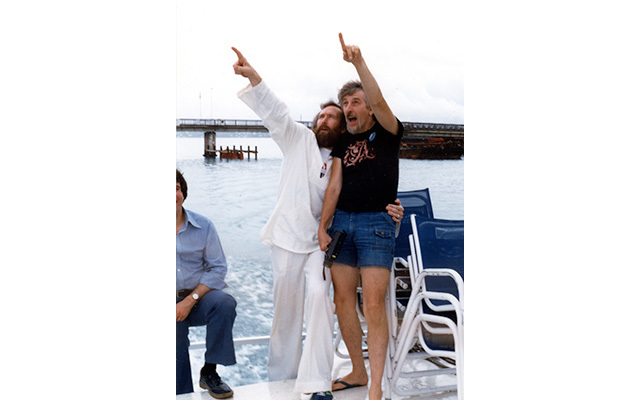 Caroll Spinney and Jim Henson in I AM BIG BIRD: THE CAROLL SPINNEY STORY a Tribeca Film release. Photo courtesy of Debra Spinney. (13:42) Jesse Thorn: Are you ever when you're in the costume, especially now and recently, worried about just simply put, your safety? Caroll Spinney: Well, I don't think there's generally much danger, although I did have some very dangerous moments when one time a klieg light missed me by 18 inches. Weighed over a hundred pounds. Jesse Thorn: Because you have to walk around and your only reference is a view through the camera's eyes. You can't see out of the costume. Caroll Spinney: No, I can't, and it used to be, television wires going to the TV sets [were] like an inch and a half thick, it was a big cable. Now it's the size of a regular cable, so that's not quite so dangerous, but those are a real tripper! And I have fallen down a few times. I've fallen off a few stages. One quite a fall, one of them in Guam. Caroll Spinney in I AM BIG BIRD: THE CAROLL SPINNEY STORY a Tribeca Film release. Photo courtesy of Debra Spinney. (15:06) Jesse Thorn: But not every [80-year-old man] has the problem of walking around in a giant yellow suit, right? Caroll Spinney: You have to walk confidently, and I try to study everything that's around me, and my assistant, Lara, I'll have her aim me, because I can't see. We can remove a feather or two, but now we're in HD. You can't do that. You can even see that little spot there's a feather missing, so everything shows, but there's some danger. One time that same klieg light, it smashed to pieces and it had been lit! So a big burning chunk of asbestos—I didn't think it burned, but it was like a glowing coal—it landed in one of those fluffy rings of pink around [my] legs and the cloth they'd used to make it was highly flammable, it turned out. Suddenly I'm looking down inside [the costume] and I said, “Something feels hot!” I looked down and I see an orange flame and it started getting long enough to go inside the suit, and I was like, “Oh, my God.” I said, “Hey, I'm on fire,” and people were just worried because I'd almost gotten hit. It was only a matter of seconds between the hit and me being on fire, and one of the cameramen, Richie King, he saved my life. He went over and he patted the flame out with his hand. So I almost burned to death at the same time as almost being crushed to death. (17:36) Jesse Thorn: I want to play a clip that you share in the movie, Dave. It was something that I hadn't thought about since I was a toddler, I guess, or I hadn't seen since I was a toddler, and that is the show that came after the passing of the character Mr. Hooper which was precipitated by the passing of the man who played him, and Mr. Hooper's store was sort of the center of Sesame Street, and there was really a lot of questions as to how to address that this had happened, and Big Bird turned out to be at the center of it. Let's take a listen. Jesse Thorn: It's hard for me to listen to even now. Caroll Spinney: I'm starting to cry myself. Jesse Thorn: What was it like when they handed you that script? Caroll Spinney: Well, I was wondering because one of our funniest writers was the one that wrote it. He was the head writer at that time, the fabulous Norman Stiles. I thought it was probably the greatest script I'd ever seen come down to us to use and I thought it was beautifully done, because the question was: Do you tell 4-year-olds about people dying? And they thought they we could just say, “Well, Mr. Hooper has retired in Florida,” but that was just an easy way out. So they did some research and said, “We think we can do this,” and I think they did a great job. I think it would be a good service to have that as a video to show children who've lost their grandparent or something, but anyway it really was, I think, beautifully done. One of the finest things we ever did. (22:49) Jesse Thorn: When I started watching Sesame Street with my son, who's a toddler, I was reminded of how deep that well of love that seemed to come out of that show was and still does come out of that show, I wonder if that's part of what has kept you, Caroll, so deeply tied to this world for 45 years. Caroll Spinney: Well, I'm kind of encouraged by the fact an awful lot of artists of performance or paint do seem to have a long life. Perhaps it's because there's a lot of purpose in life for them. It hasn't become boring. My hero is Señor Wences. Do you remember “S'awright? S'awriiight,” and he did very funny things on Ed Sullivan, of course that's way before your time, but still sometimes you'd see his stuff. He'd performed on the very last day he lived, on stage in Madrid where he's really from, and it was basically a half puppet act and mostly a ventriloquist, but without a traditional ventriloquist’s dummy. He'd draw a face on his hand and use his thumb folded as the lower jaw and talk to Jan. Well, he performed on the last day of his life. He went home and went to bed and that was...well, he didn’t get up, but kind of a nice way to go since he was 102, and so he's my great hero. I'd love to emulate him, and I don't know if I'll be that lucky. I feel 80 definitely feels older than 79, but I'm very optimistic and optimism, I think, is one of the things that is good to live on. I Am Big Bird comes out this week online, then rolls out in theaters across the country. Check out the film's website for screening dates and times. You can subscribe to Bullseye With Jesse Thorn via iTunes or any podcast player you like. It's also on various NPR stations across the country.